We learn a lot about life from our dads. Whether it’s how to communicate successfully in our marriages, how to be fathers ourselves, or just some good practical advice on career or finances, dads share with us a special kind of wisdom. Last month, to celebrate Father’s Day, brightpeak financial launched a campaign to collect the Best Dad Advice from around the U.S. They challenged moms, dads, sisters and brothers to share with us the best advice they’ve ever received from their dads. The results were inspiring. Hundreds of entries poured in with advice on love, faith, money, parenting and facing adversity. The submissions were insightful, smart and even humorous, but above all, they were inspirational. brightpeak then compiled the best entries into the Best Dad Advice eBook. 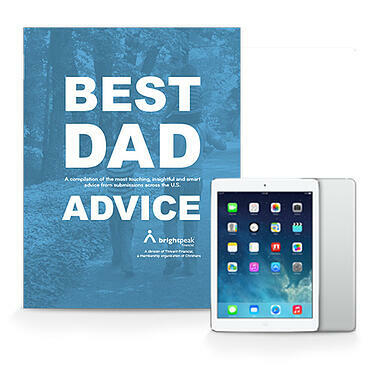 CLICK HERE to download your free Best Dad Advice eBook and enter the iPad Air Giveaway! If you would like to read the whole book, including sections on Money & Career, Decision Making, Attitude, Practical Life, Faith, Love, and Family, download the Best Dad Advice eBook below. You’ll also be entered to win a free iPad Air when you sign up! Brightpeak financial is a division of Thrivent Financial for Lutherans, a membership organization of Christians, created to help young Christian families build financial strength so they may live life with confidence and generosity. Learn more about brightpeak financial here.